90 Day Challenge: Day 7 | Kay Rice, M.Ed. What’s on my mind this morning? Well, in addition to getting my cup of coffee—I’m thinking about a little sign I have. 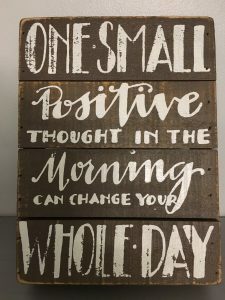 It reminds me about how important the beginning of our day is and how one little thought can make a difference in my entire day. I do believe it is important to begin each day with gratitude. 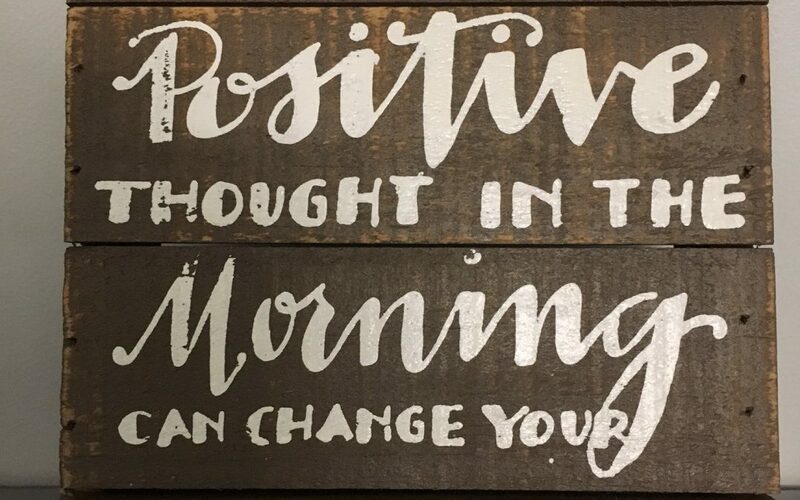 If you can jut think of three things that you are grateful for in the morning, it can set the tone and improve your entire day. When I lived in Peru I learned this was a Universal Law the Andean people believe and practice and refer to as “ayni”. I grew up thinking that gratitude was something you gave after receiving something. In Peru, they plant seeds of gratitude in the beginning of every endeavor. Their Thanksgiving festival is celebrated at the beginning of the growing season. Vendor’s in the market may put in “just a little something” extra. The reason they do this is to “plant the seeds of gratitude” for the next sale and for their next customer. 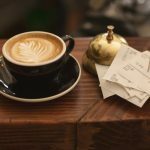 What would happen if we all made this part of our morning ritual, to think of (or even better) to write down three things that we have gratitude for. So what if you hare having a very hard time, and gratitude is difficult? I can recall a young man I met and he exercised this practice. Some days he would start out just being grateful that, “I am breathing and I am alive.” This morning I am grateful for this amazing day with sunshine, perfect temperatures, and a gentle breeze. I am grateful that my knee is getting better and better and now I can walk almost normally again, and I am grateful for this 90 Day Challenge, and the good, healthy nutritious food I’ve been enjoying, and I’m grateful for the five hour visit I had on the phone with my friend who called from the left side of the country (Arizona)—staying up until 2 am was worth the visit! Note: If I refer to a product or provider in my posts, I want you to know up-front that I may have an affiliate connection with them. This means if you click on the link and then purchase I may receive a small commission or referral fee for that purchase. My reviews will be honest and I’ll let you know which products I’ve tried and whether I genuinely liked them (or if I didn’t like them). This helps pay for the 90-Day Challenge, but you are never, ever required to purchase any products I refer to if you don’t want to. I woke up to a glorious day with sunshine and temperature in the low 70’s. 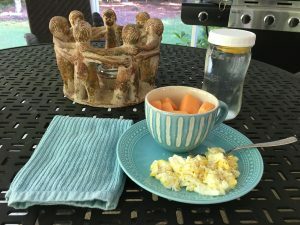 There was no choice but to sit out on the back porch to enjoy both my coffee and some scrambled eggs and cantaloupe for breakfast. While I ate I noticed my little lizard friend with his head pointed down towards the dirt; he must be getting ready to head out for the day to catch some bugs. 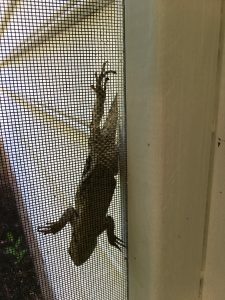 This little lizard had been living on the outside of my screen since 2014 when I was here. Sometimes he even lets me scratch his belly through the screen. Where are the Macro-Nutrients in this meal? After breakfast it was time to turn off the bone broth that had cooked over night. After cooling, I strained it through some cheese cloth, let any fat come to the top as it cooled, and then packaged it for refrigerator & freezer. I have plenty of broth for soups & other recipes and to have a cup here and there for it’s healing properties. This broth is full of minerals and collagen. Great for joints, skin & hair. 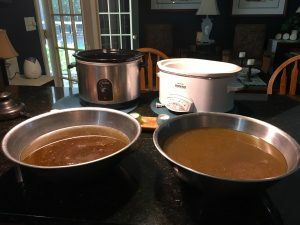 It may seem like a lot of trouble for broth, but really it is simple and so worth it. And this batch will easily last for 3-4 months so I won’t have to do it again for quite a while. At lunch I grabbed one of those small mason jars with the diced chicken with mayonnaise in it that I made the day before. I decided to make classic chicken salad with it, so I added diced onion, celery and dill relish. 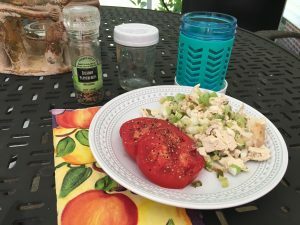 The chicken salad with a sliced tomato made a great lunch. La’Croix Lime Sparkeling water made it refreshing and counted towards my daily water intake. Where are the Macro-Nutrients in this meal? Dinner was a replay of the dish I had last night, the Italian Beef and Sauce. I think this might have been my favorite meal all week! I really WANT to post the recipe so I don’t forget how I made this. Remember, generally I make all of these recipes “on the fly” with whatever I want. However, I must say that preparation plays a big part of that. 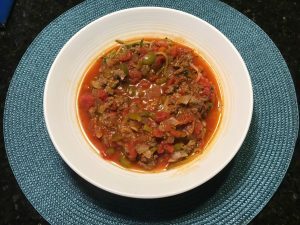 I try to keep my pantry, freezer and spice cabinet filled with lots of options so that I can whip up something tasty with whatever else happens to be on hand. 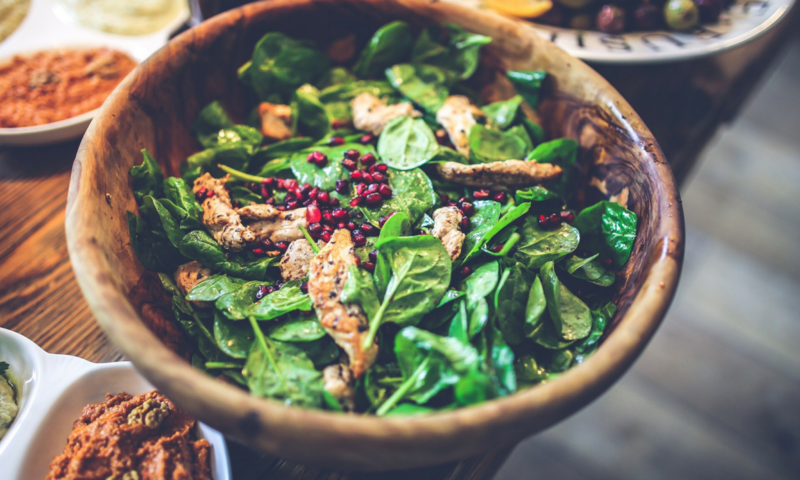 Should I remind you where the macro-nutrients are in this meal? Note: If you sign up for the 90 Day Challenge, I’ll share my Trader Joe’s Shopping List with you as well as my regular grocery shopping list/guide. Darned I was tired. I’d already been lacking in sleep, but last night when a friend on the West Coast called (who’s time zone is 3 hours behind mine), I was all too happy to stay up chatting until the wee hours of the morning. I think I had brain fog all day, and was happy to make myself some Celestial Seasonings Sleepytime Tea and have an RX Bar and call it a night. 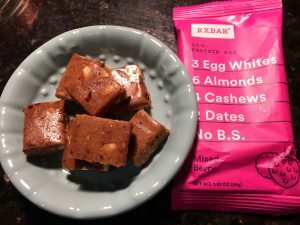 Whites, the almonds & cashews provide fat, and the dates provide protein. If you decide to try RX Bars, remember for the first 30 days of this program we are avoiding legumes, so no peanuts. The first RX Bars I found at Trader Joe’s, but they have a limited variety in comparison to what is available from the company. 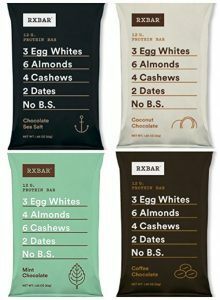 I just ordered this RX Bar Variety Pack from Amazon, since I know I want to keep them on hand not only when I want a smaller meal, but they are perfect for my EFK Stash!